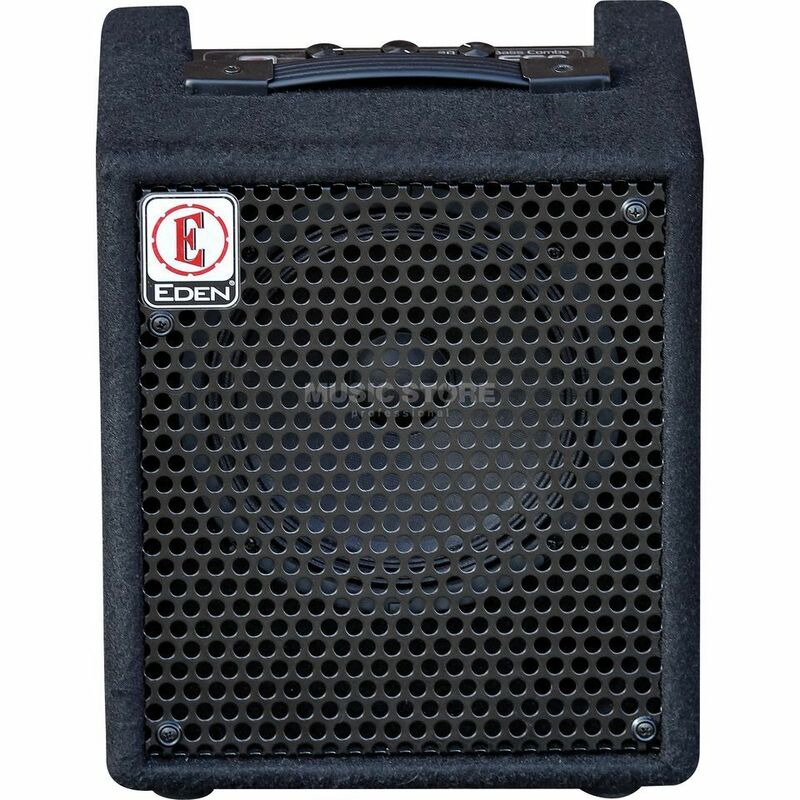 The Eden EC8 is a bass guitar amplifier combo, with 20 Watt output, and a 1x8" speaker. The EC8 is the perfect introduction to Eden tone, a combination of a 20W easy to navigate amplifier and Eden designed 8" speaker and cabinet. Featuring a 3.5mm (MP3) jack, 1/4" headphone jack, with volume and tone control and Eden’s "enhance" feature, the EC8 is a fantastically portable and compact practice bass combo. There are design problems with the EDEN EC-8 20W COMBO BASS AMPLIFIER. I bought this new on eBay 7 months ago after the others being returned to sellers for mains hum/buzzing. This one was working perfectly with absolutely no mains hum or buzzing for the first 4 weeks. I plugged the amp into a 230 volt mains inverter with the amp power switch turned OFF. On turning the mains inverter ON with the amp power switch turned OFF, there was a lot of extremely loud buzzing coming out of the amp speaker, and this was with the amp power switch in the off position. After hearing that, I did not turn the amp on, I just unplugged it, then took in back in the house and plugged it into the house mains socket to check it was still working. I switched the amp on and it powered up and I could then hear a distinct mains hum/buzz coming out of the amp speaker. This Eden EC8 amp has developed a mains hum/buzz when turned power is tuned on. It even does this with nothing plugged in it and makes no difference whether the knobs are turns left or right and the buzzing does not change in volume when the volume knob turned up or own. The hum/buzz is also present when headphones are plugged in. I can hear this hum/buzz from about one to two metres away. Although it works well and is a great little bass amp, it is not ideal for recording due to the hum/buzz being present and it makes the using headphones annoying due to the buzzing. When the amp is in use with a bass guitar plugged in and being played obviously the buzzing noise is not heard, but you can hear the buzzing as soon as you stop playing. I believe this defect should not have occurred from an inverter, especially since the amp was turned off at the time. On further inspection I found that the mains switch is on a single pole switch, meaning that it only cuts the live mains lead power and this allows the mains to go in up through the neutral mains lead. This is a serious issue if you would happen to plug it in a mains socket that was inadvertently wrongly wired in reverse polarity or the mains plug was fitted incorrectly in reverse polarity. This is a very bad and unsafe design by Eden. I have had 3 of these bass amps from different sellers and every one has had a mains buzz/hum and you simply can not use these for any kind of recording due to the mains buzz/hum. I can only recommend that Eden EC-8 20 watt bass amps are not fit for purpose and don't buy from anywhere. You will most likely end up having the hassle of returning it for a refund or repair. (and if repaired it will still have the same defective design fault. Stay clear of it and don't buy it.